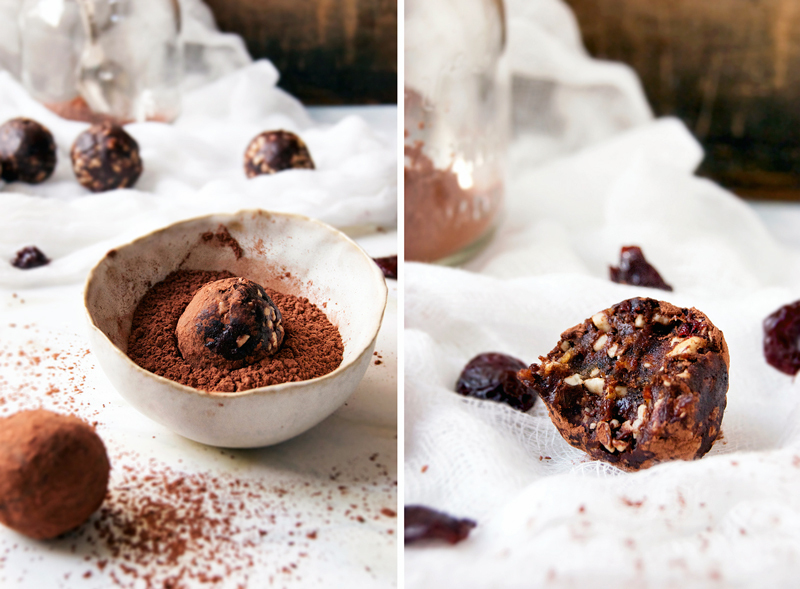 These raw & vegan chocolate cherry energy bites are made with dates, cacao, dried cherries, and cashews. They taste like the old school dessert but they’re super healthy & perfect for quick snacks. Hi, February! We’ve had a lovely winter this year, and I might go so far as to say it’s almost over. There were only a few short stretches where the weather was around -30C, and so many days of above -10C. We usually have snow from October to April, but while there’s (of course) snow on the ground right now, there isn’t very much. Umm, melting in January? What’s happening here?! I’m not sure I want to question it too much (I’m not too sad about the lack of -50C days), but there have been some pretty significant changes in the weather patterns since I was a kid, and even more since my dad was growing up in this area. You might have noticed that this space had a bit of an overhaul last week. I installed a new theme and updated a few things, and I like it so much more now. I found everything looked a little dark, and I’m digging this brighter and more modern look. Sorry I’ve been absent a little longer than usual, too. Graham’s always had some pretty serious issues with his stomach, and he’s recently been getting some tests done to try to figure out what’s wrong. This past weekend was spent baking with white flour (which was pretty weird) and helping him prepare for some -oscopies. A liquid diet apparently stinks, and he’s happy to be able to eat our normal food again now. I’m a little worried about the results, but sometimes all you can do is wait. It was my sister’s birthday a little while ago, and I had the idea for these little bites then. She loves black forest cake, and almost always requests it for her birthday. I made these paleo black forest cupcakes for her last year. She didn’t get any of these bliss bites this year, though. Sorry sister. 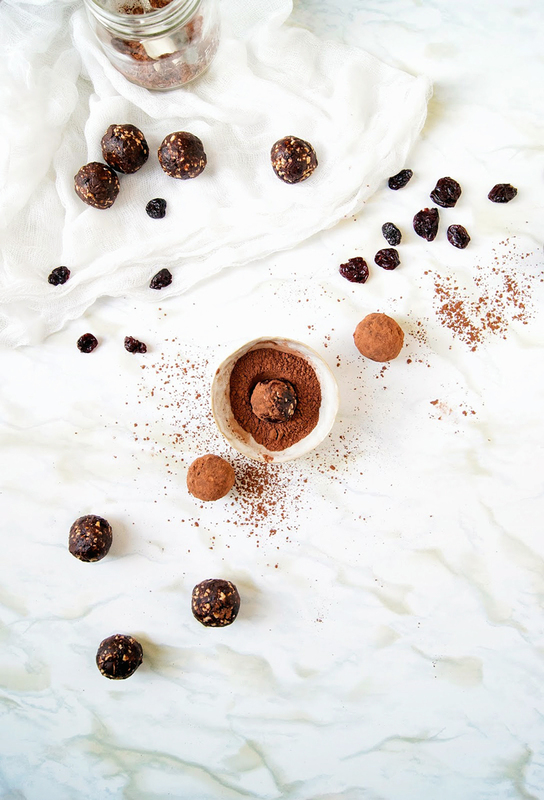 These black forest energy bites are full of chocolate and cherry flavour, with cacao powder, chocolate chips (or cacao nibs), and dried cherries. 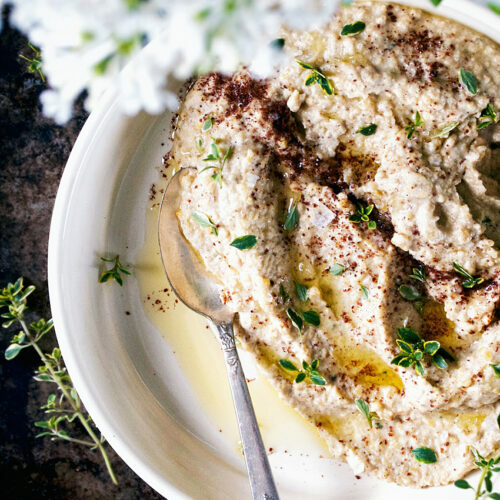 The cashews and coconut oil add creaminess. I find dried cherries quite sweet, so I like to roll the bites in some more cacao to cut that and add to the dark chocolate flavour. 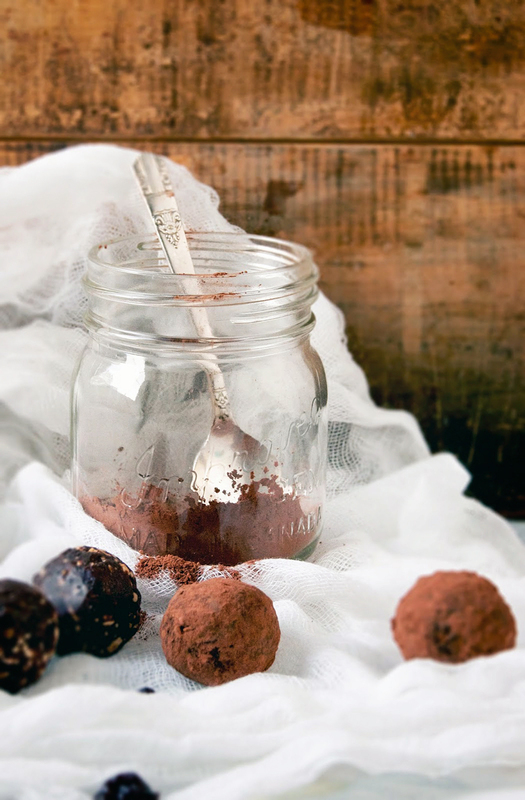 Like any energy balls, these will help keep you feeling good throughout the day. They are a little on the high side in natural sugar, so avoid eating ten at once. Think fruit – you wouldn’t eat a crate of oranges in one sitting, so treat these the same way. These are very simple to make and only take a few minutes with a food processor. Honestly, if you want to make a lot of your own food, I can’t recommend a food processor enough. I use it literally every day. It just saves so much time, and I don’t think I’d be making nearly as many things if I didn’t have one. You don’t need to spend a lot of money on it – the one I recently melted only cost thirty dollars. The melting was not related to the quality of the machine. It was just me. 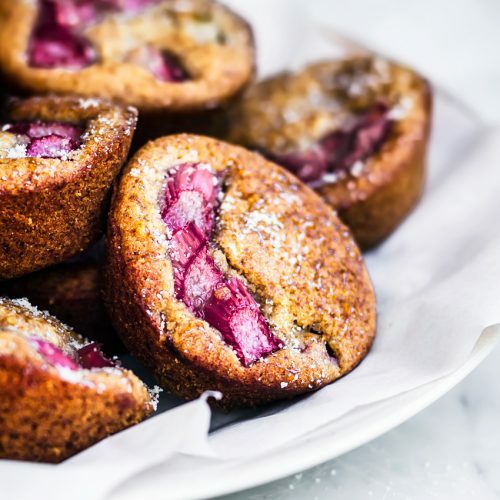 Make these for your sweetie (better yet, yourself) for valentine’s day and impress them (or you). 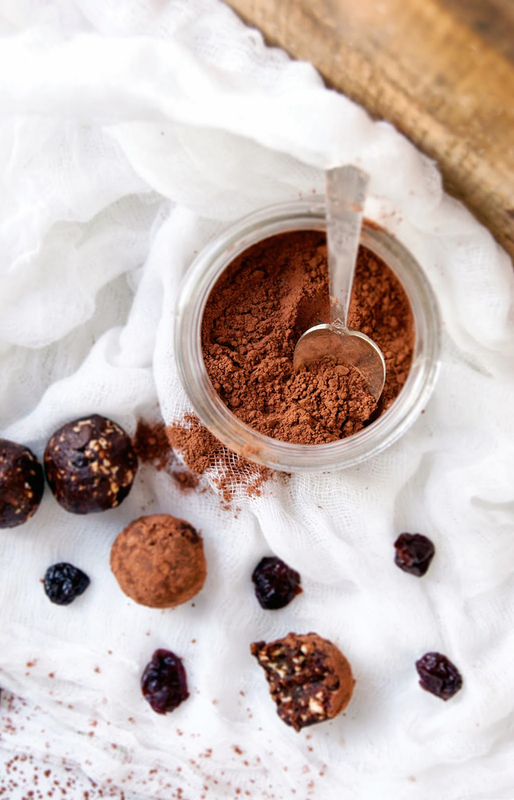 These raw & vegan chocolate cherry energy bites are made with dates, cacao, dried cherries, and cashews. They taste like the old school dessert but they're super healthy & perfect for quick snacks. In the bowl of a food processor with the blade attachment in place, chop the cashews, cherries, and chocolate chips into small pieces (if you're using cacao nibs, they don't need to be chopped). Add the dates, cacao, coconut oil, vanilla, and salt. Pulse until the dates have blended and it's starting to stick together. If the dough won't roll into balls, add one or two more dates. Take a small amount of dough and roll it into a ball with your hands. Place them onto a plate or baking sheet that's been lined with parchment paper. Repeat this until it's all been used. Some pieces of cashew or chocolate might fall out, but you should be able to just stick them right back into the date mixture. Once all the balls have been formed, put them in the freezer (on the parchment) for 30 minutes. If you want to roll them in extra cacao, now is the time. Store them in a sealed container in the fridge. They will keep for several days, or weeks if you keep them in the freezer. You can also make small bars out of these (like larabars, which are hugely overpriced and you should just make these instead) by pressing the dough into a parchment-lined container and freezing it for half an hour before cutting in into bars. 1. If your dates aren't soft enough, soak them in hot water for about half an hour. Drain them well before using. 2. You can use regular cocoa powder instead of raw cacao if it's what you have. The raw stuff is higher in nutrients, though, and you'll have to double the amount if you use cocoa. I've tried them with both, and they both taste good. 3. I put coconut oil in all my energy balls. 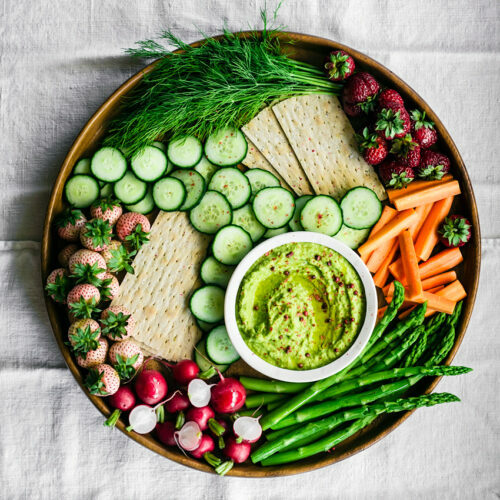 Healthy fat helps to keep your energy levels up, and it also makes them tastier and easier to roll. 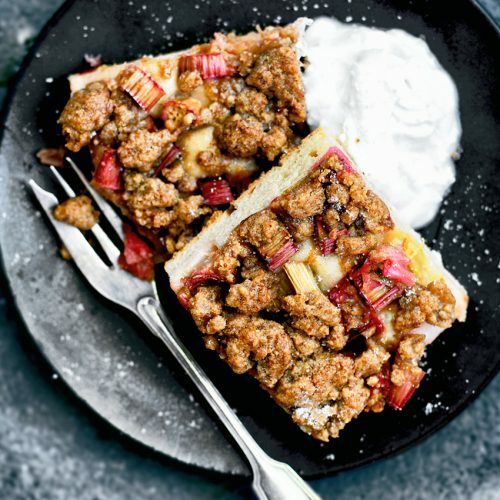 You can have your cake and feel good about it! I'm wondering what your first used is. Blender, maybe? I guess that's what I use most, though. Graham has decided the cure to whatever it is is just for him to eat EVERYTHING. Thank you, Traci! I'm glad you like it!